Thanks to the acquisition of hundreds of acres of land on the south and western side of Mt. Institute, Berkshire East was able to confront perhaps its biggest issue - a lack of novice terrain. Work started following the 1993-1994 season. Some press accounts projected 5 new trails and two new lifts. Dynamite was used to blast the cliffs on the back side of the mountain, as to allow for a consistent, novice grade. 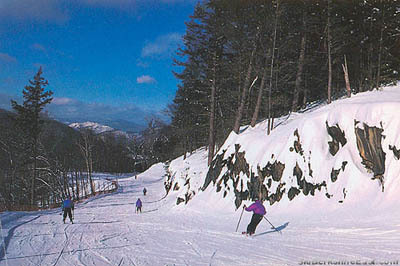 Opening in the 1994-1995 season, the Outback complex featured three new beginner trails - Ridge Run (now known as Outback), a connector from the Diamond Express chairlift called Riva Ridge (originally planned to be called Sun Dance), and a connector from Ridge Run to War Dance called Sun Dance (originally planned to be called Riva Ridge). A fourth trail was cut from near the bottom of Ridge Run to the bottom of Exhibition, however it would not be completed until about half a decade later. While the terrain was well received, there were still issues to deal with - inaccessibility due to an aging summit lift (and a challenging-to-load sub-summit lift), inadequate snowmaking, difficulties in crossing back over to the summit chairlift, and no night use. 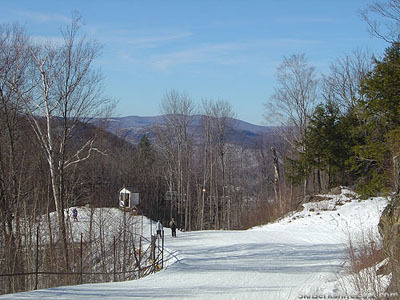 Perhaps as part of the speculated two new lifts, a Poma triple chairlift (from then-defunct Magic Mountain in Vermont) was installed to the summit, replacing a 32 year old Mueller double chairlift. It is possible that the second of the two reported lifts would have been a replacement for the Exhibition double, leading to just above the top of Sun Dance (uphill from the present day top terminal of the West Quad). In addition to the chairlift, the Main Lodge was dramatically expanded, and the snowmaking capacity increased. 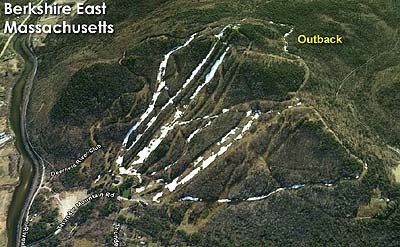 In 1999 a fourth trail, Snowdance, was added to the Outback complex. 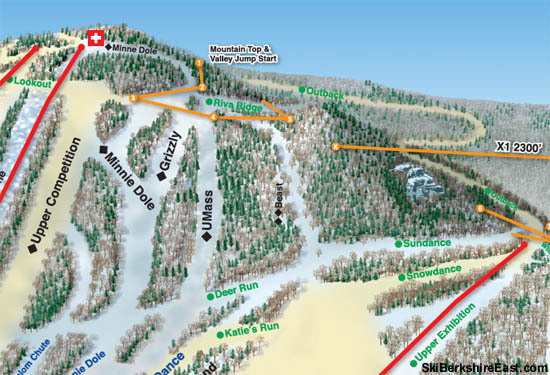 Located between Sun Dance and the end of Outback, the trail allowed skiers to access the top of the Exhibition double chairlift, as well as the Katie's Run crossover to the main mountain. 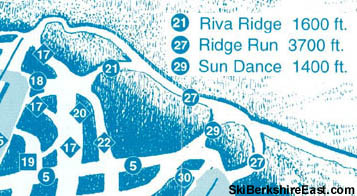 In addition, night skiing was added to Outback and Snowdance.